Former First Lady Barbara Bush, center, flanked by her children and literacy foundation co-chairs Jeb Bush and Doro Bush Koch, announces that Grace Place has been added to the foundation's network of literacy programs. Photo from Grace Place. NAPLES – Grace Place, a learning center housed in the former Golden Gate UMC, has long championed a teaching approach that targets children and their parents. Last week its achievements were recognized by the Barbara Bush Foundation for Family Literacy, an honor that also promises annual funding to help expand and enhance programs that teach English language and reading skills to parents and preschoolers attending classes together. Former Gov. 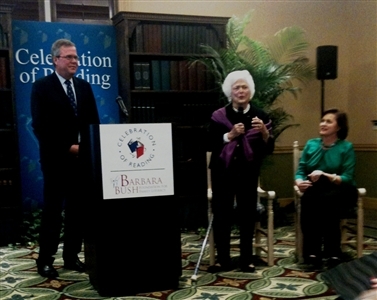 Jeb Bush and former First Lady Barbara Bush welcomed Grace Place to the foundation's network of literacy programs at a news conference last week in Estero, where the Bushes also were joined at the podium by Doro Bush Koch, daughter of former President George Bush and sister of former President George W. Bush. Rev. Stephanie Munz Campbell, Grace Place executive director, said the learning center staff has been working toward the achievement for about two years. Exact terms of the ongoing funding have not been cemented, but she anticipates it will extend learning opportunities to more families in the center's Mom and Tot program. "We have a waiting list of parents with young children who are eager to learn to better the lives of their families and to give back to their communities," Campbell said in a prepared statement following the news conference. Grace Place is one of eight new Florida literacy programs and 30 others nationwide to join the Bush network this year. That makes a total of 200 in the Sunshine State and more than 900 in the U.S., said Elizabeth Hirst, the Bush foundation's senior vice president. Campbell said joining the network not only facilitates sharing of ideas among programs with the same mission but includes technical support and an assessment component that will help Grace Place track the progress of its learners. The center's Mom and Tot classes are held twice a week for parents and children ages 2 1/2 to 4 to attend together, along with separate English language classes for the adults. Grace Place is sandwiched between rural Immokalee's farm fields and upscale neighborhoods in Naples. Many of the families that seek assistance there are former migrant farm workers from Mexico or Central America trying to secure jobs in the Naples service industry. Grace Place serves about 800 people of various ages with programs for infants and school-age children as well as adults and toddlers. 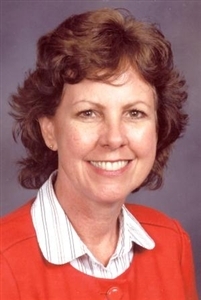 Campbell said in a phone interview that she thought Grace Place's approach of involving entire families in the learning process attracted the attention of the Bush Foundation. Mothers and children gather to hear a story read in the multipurpose room at Grace Place learning center on the former Golden Gate UMC campus. Photo by Susan Green. "They're very interested in helping the families learn English and making that a priority," she said. "They don't tend to start up a program. They look for programs that are doing that and doing it well." Grace Place got its start in 2003 as a United Methodist outreach effort on the former Golden Gate UMC campus. Later, after the church closed, the ministry became an ecumenical project supported by churches of several denominations in the Naples area. In 2010, the program's nonprofit board bought the church campus from the Florida Conference and operates an independent program but still receives Methodist support. Florida Conference Connection posted a report about Grace Place last year. To visit the Grace Place website, click here.